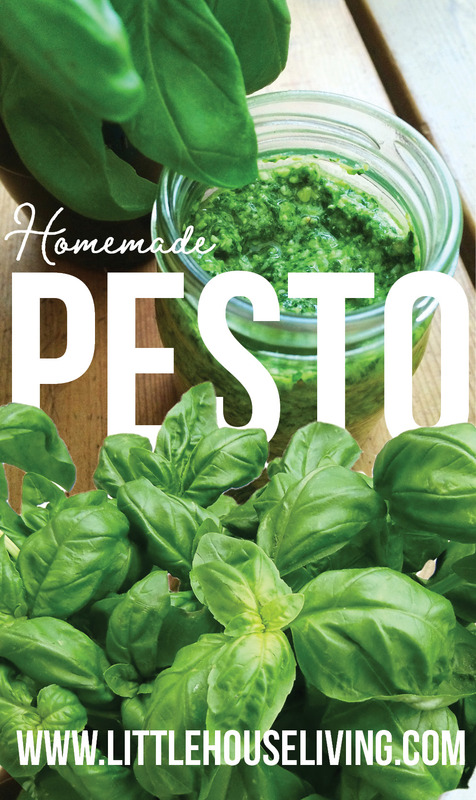 This homemade pesto recipe is made with fresh basil and a few other simple ingredients. It can be used over pasta or spread lightly over bread, and a little goes a long way. Did you plant and harvest basil from your herb garden this year? Then you might have a little bit of extra basil that needs to find a use! Or if you need a simple pesto recipe for a dish you are planning on making, you will love this one. Rinse your basil leaves and pat dry. Add them to the food processor with the pine nuts and pulse several times. Next, add the olive oil and blend until smooth. At this point, you may need to scrape any ingredients that have stuck to the side of your processor. Mince one garlic clove before adding to the processor and pulse again. I recommend taste testing at this point to determine if you’d like the other garlic clove. Scrape the sides of your processor again if necessary. Once you’ve added your garlic, add the salt and pepper, blending one last time. Transfer your pesto to a clean pint or half-pint jar. A thin layer of olive oil should begin to accumulate on top of the pesto. Twist the lid on the jar and refrigerate. Canning pesto is not recommended. The parmesan cheese, olive oil, and garlic within the recipe can create an environment for botulism to thrive in, even when pressure canned. To preserve the pesto you could place it in either 1/2 pint containers or freezer bags and freeze for future use. Fresh pesto will last about a week in the fridge if stored in an air-tight container. Freezing is the preferred method of preservation if you want to make it in advance. 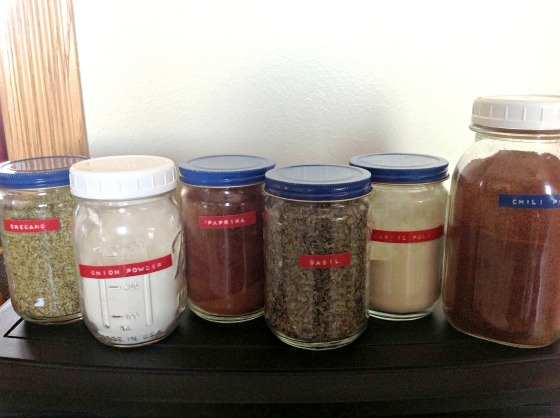 Here’s another great way to preserve pesto! Pour the finished recipe into ice cube containers and then freeze. After the pesto has frozen you can pop the pesto cubes out of the ice tray. Store them the freezer in a freezer bag until ready to use. This way you can quickly grab out only the amount you need for a recipe. –Have you ever tried Freezing Kale? –Do you grow mint? Here are 10 fun Uses for Mint! If you don’t have all the ingredients for the basic recipe above, you might be interested in some of these simple substitutions. Replace the pine nuts for walnuts, cashews, or almonds. Replace the basil with cilantro., spinach, zucchini, or other green veggies. Replace the pine nuts with sunflower seeds. Want to print this Homemade Pesto Recipe? Grab it below! Head over here to find all our other free Canning and Preserving Recipes! 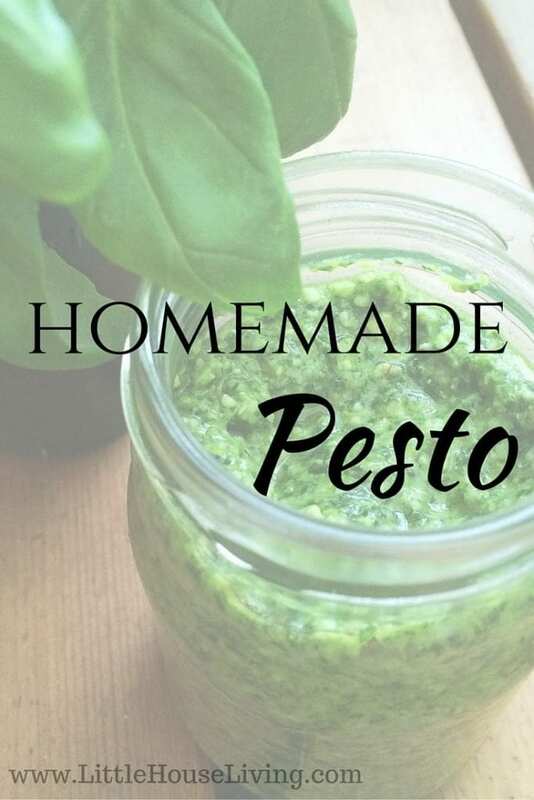 Do you have a special homemade pesto recipe? 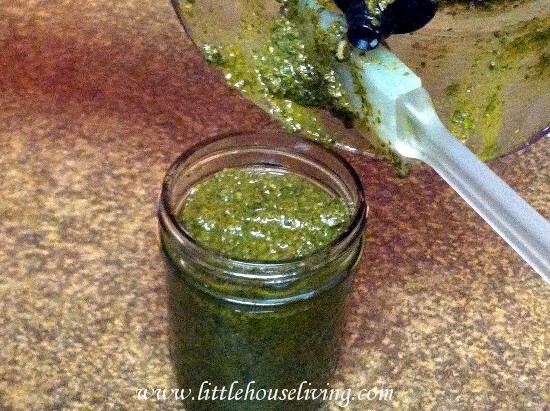 Have you ever tried preserving pesto? 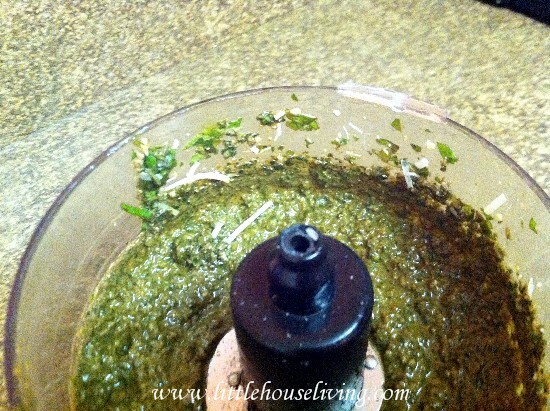 This Homemade Pesto Recipe was originally posted on Little House Living in August 2013. It has been updated as of January 2019. I make homemade pesto for us all the time! In fact, we just had it last night on one of our favorite homemade pizzas (cooked on the grill! ): roasted red potato, pear, and pesto pizza! Pine nuts are super expensive so I have learned to improvise and I swap them out for walnuts which are way cheaper. Delicious! One of my favorite ways to preserver pesto is actually to freeze it. I pour my pesto into muffin pans and freeze it until it is frozen solid. Then I take the pan out of the freezer pop the pesto out of their molds, wrap the discs individually in plastic wrap and pop them in a container/bag and put them back in the freezer. We mainly use pesto on pasta so when we make a pot of pasta we just melt a disc of pesto on the hot pasta. Delicious! This is how I preserve pesto as well, using mini-muffin tins. 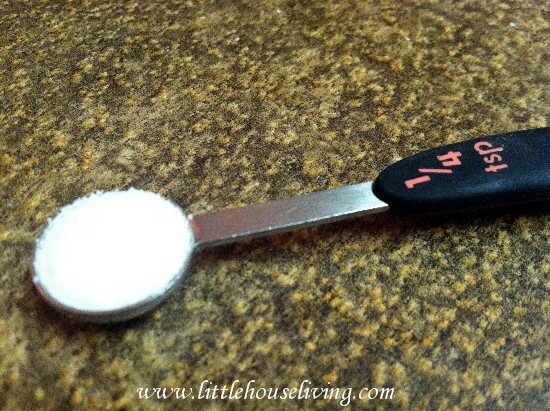 I add a frozen pat to soup, pasta sauce or fish stew. Never thought to put it directly on hot pasta. Thanks for the idea! I have considered making homemade pesto before. Unfortunately buying all the ingredients made it super expensive. I see that Kendra suggested walnuts. If you don’t grow your own basil that can also be expensive. In the summer I substituted basil with kale for big batches of pesto-covered grilled chicken. I found it definitely worth trying to see if I liked it, it tasted great, and was made very inexpensively. You can also make pesto with cilantro which is much creeper than basil and normally you can get decent cilantro all year round. Believe it or not it taste pretty similar with all the other ingredients. As opposed to pine nuts, I have found that using roasted, unsalted sunflower seeds to be a great substitute. I have also made pesto with arugula spinach and both versions are yummy! Find a good farmers market, or Italian grocery store. I bought my pine nuts at Costco, and then had 4 other people go in with me. The pesto was not that expensive to make, using my own plants and farmer market plants, I was able to make 6 pints, which I keep in the freezer. When I open a jar, it will last for at least 2 weeks or longer is you remember to add olive oil to the jar, to make sure the pesto is always covered in oil. Old Italian trick that has been used for hundreds of years. I use walnuts too, since pine nuts are so expensive. I also peel my garlic and then roast it in a sealed tin foil ball with some olive oil in the oven before making it. I find roasted garlic to be a lot better in the pesto. How long does pesto last in the fridge before you have to worry about botulism? I have a daughter who is allergic to tree nuts, so I substitute sunflower seeds with good results. Now I just need to get better at growing basil. I have also substituted zucchini for some of the basil, when I don’t have enough basil. When seeds are added to the potential protein in pesto, there are many options. An excellent suggestion! I hadn’t heard of adding zucchini but I have seen parsley and broccoli used. With respect to keeping pesto in the fridge for an extended time, the layer of olive oil is a must. However … you must also ensure there is no pesto above the oil line. After I use some, I scrape all the pesto from the sides back down to the surface. I top up the oil before I return the jar to the fridge. 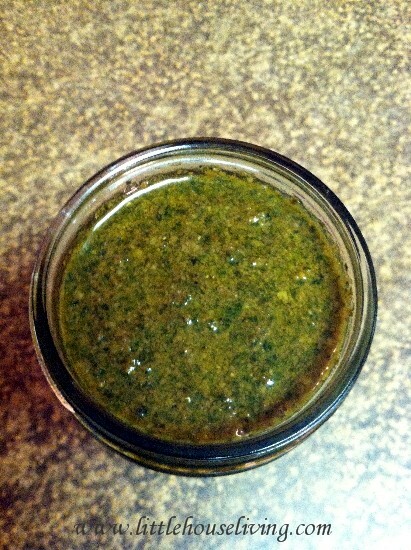 Every third or fourth time I use it, I transfer the remaining pesto to a clean jar. Perhaps I am over cautious but I have lost many jars to mould on the sides of the jar. Pesto is also good on green peas with a little lemon juice. Of course, I like green peas with horseradish so this might be a personal preference. Pine nuts are expensive– I found that using walnuts instead is a lot cheaper and tastes just as good! Actually, any kind of nuts work. I love this website, it has given me so much inspiration and to think about what matters most. Please keep up the great work! The pine nuts really should be toasted first. And 1/3 cup of pine nuts aren’t that expensive and are well worth it in this recipe. Walnuts are too bitter to me. Try mixing pesto with mayonnaise, spread on Italian bread with seasoned grilled vegetables (zucchini & eggplant) and fresh mozzarella. Mama mia! Enjoy! The recipe doesn’t show on this page. 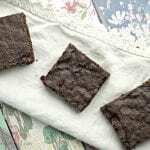 Is there another link to view the actual recipe? 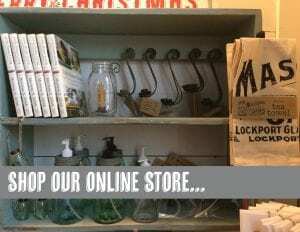 Please refresh the page. 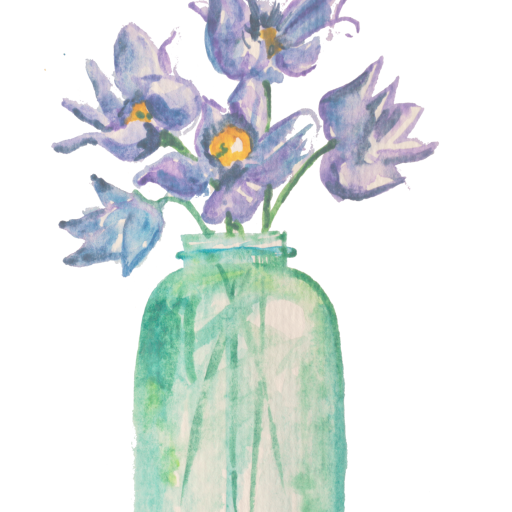 The site was having a hiccup this morning but it should be fixed now. Try roasted, unsalted cashews instead of pine nuts. Delicious! I found that unsalted cashews roasted in the oven are my new favorite nut for making home-made basil pesto. Alot less bitter than pine nuts. I also like to use some chili infused olive oil (not the entire amount) for a bit of a kick. Ho stinging nettles are a great free substitute for the basiland i use walnuts form our garden. By adding pine nuts, is this just to give the pesto a hint of pine nut taste or is it for adding bulk (consistency) to the sauce? Can I omit the pine nuts and cheese? We have dairy allergies in the house. It’s more for a little added taste but you could leave them out. Pesto can easily be added to or subtracted from to make it work for your family. I use sliced almonds (you can toast them or not, I have used them untoasted and it was fine) instead of pine nuts because I have them on hand more often. We put them in cereal and on oatmeal so they are almost always in my cabinet. For economy’s sake I have always used blanched almonds, as I’m allergic to walnuts, and the results are just fine! Can you also make pesto using fresh spinach instead of basil? Also, I use raw unsalted almonds instead of pine nuts and omit the salt altogether. I make pesto with all the greens I can find. And all the healthy nuts. Each nut is about 1/8 of a cup. 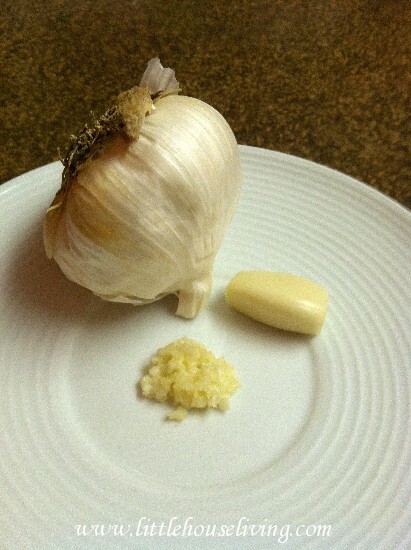 I add 2 bulb of garlic, it’s not alot, u alo see that it will make a big batch. I also add 1 cup of lemon juice, salt and pepper to ur taste. And sometimes to give heat some heat I will add 1 tablespoon of crushed chillies. And u puree this in food processor a batch at a time. I than put this in a large bowel. And I mean large, even a stew pot will work. Once I am done with that. I will add the nuts, oil, garlic, salt, black pepper, and any other seasoning I like. 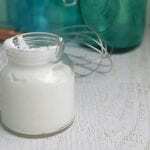 I store it in quart size zip lock bags, and I put one batch in the jar. I try to use it in many dishes, and add it to lot of sandwiches. Since my kids r not vege lovers, this is the best way to give them their greens, that way they won’t be able to pick out what they don’t like. Pesto is a very versatile recipe. U can make it with as many ingredients or as little of ingredients and can work with many different ingredients and will get good result. The best part is kids can’t complain cause u use it in place of mayo. I spread pesto on one side and homemade hummus on the other side. Hummus is also a dish I make with many different types of beans. Yup… best way to put this dish in everything. 2 to 4 tblsp. In a dish goes a long way. Makes soups and stews smooth and gravy. Hi there from Australia. I am also a regular pesto maker, in fact made a couple of jars today. I was interested to see the comments about freezing it, and am going to try that as I have a bumper crop of basil and a bit wary of just leaving it in the fridge for months. 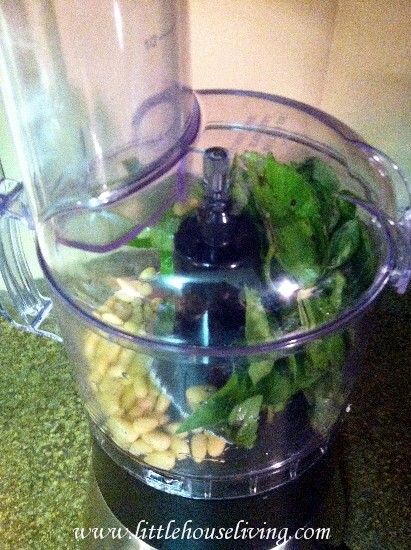 Blent basil, oil, pine nuts and salt together until smooth using a food processor or mortar and pestle. When evenly blended, stir in the grated cheese. 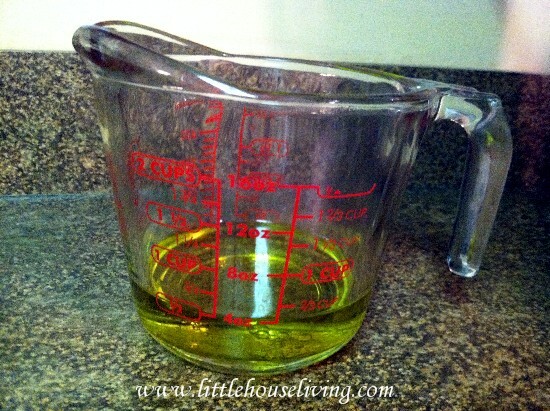 Put into a screw top jar (or jars) and cover the top with a thin film of olive oil. Store under refrigeration. It definitely improves if you leave it a few days. 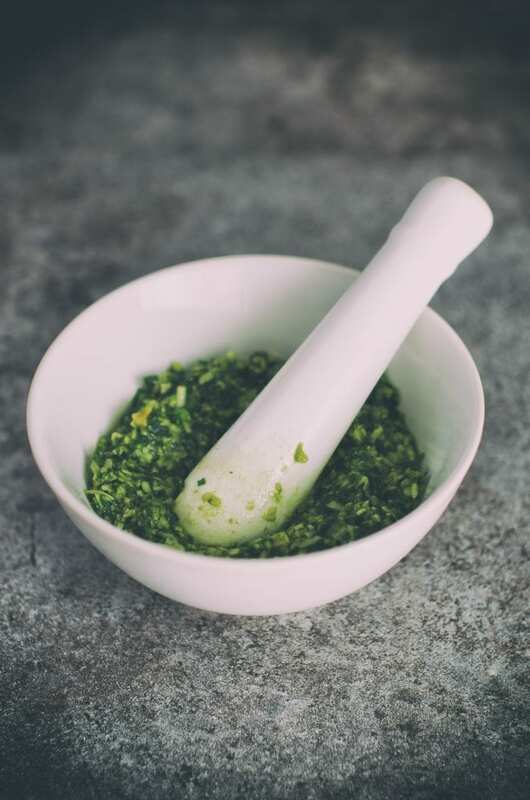 This is a classical recipe and it produces a great tasting, intense pesto. Apart from using it in the usual way with pasta, it’s great also with grilled vegetables, particularly aubergines or with boiled potatoes. I tried your recipe and I am sooooo pleased with the result. I did add more garlic. I will say that the comment about the quality of your ingredients affects the final product is 100% spot on! No more store bought pesto for us! I haven’t tried it but it’s worth a shot 🙂 Let us know if it works for you! Do you think they are best kept raw ?? or would u roast them ??? I tried this recipe today and it was the first time I’ve ever made pesto. I definitely want to incorporate into more of my cooking and change up to new dishes. I first blanched the basil to keep it as bright green as possible. I’ve read people complain of it turning black. Well it worked perfectly. Stayed a nice green color. I also used macadamia nuts for the pine nuts. I love macadamias and it gave the basil a hint of sweet. 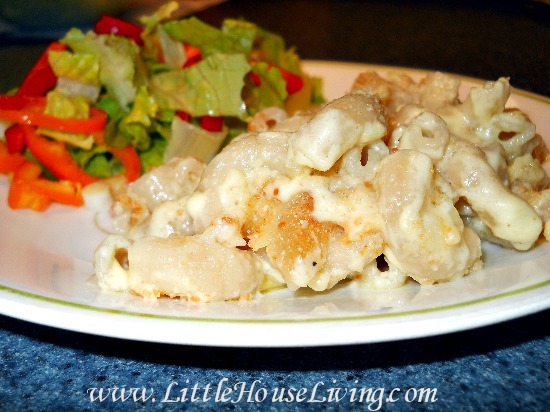 This is a great recipe and thank you for sharing it. Next time I might try using romano cheese to pack a little more punch. How long will this keep in the fridge? And can I freeze it? I assume not but wanted to ask. Thanks! Yes you can freeze it. In the fridge it will keep for up to 2 weeks in an air tight container. My family loves pesto, and I prepare it all times of the year, not just in summer when basil is plentiful. 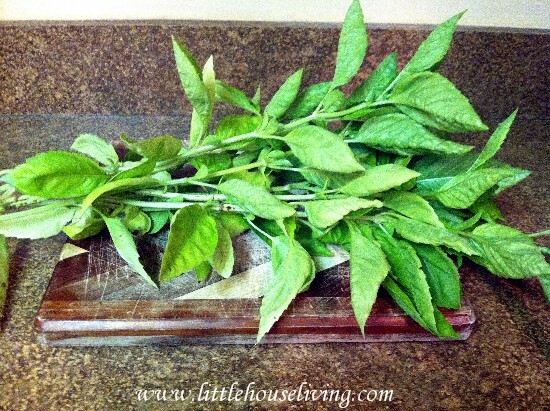 Pick basil, remove stems from the leaves and discard stems. Food process leaves and freeze in small plastic containers, label date very important. Will keep indefinitely in freezer. When using, add oil, cheese, garlic, etc and it will taste as good as the fresh you pick out of the garden. I have used basil that is 5 years or more old and it is just fine. I know this is an old post, but it is one of my favorite pesto recipes! I was just curious, do you put the basil leaves and stems in the processor? I have only been putting the leaves in, but if the stems work too I would love to use them. Thanks! I love pesto. With lots of garlic! Walnuts and cashew works well with it too. This looks so good! Thanks for the storage tips, too. I had no idea you couldn’t can something like this so that is super helpful. 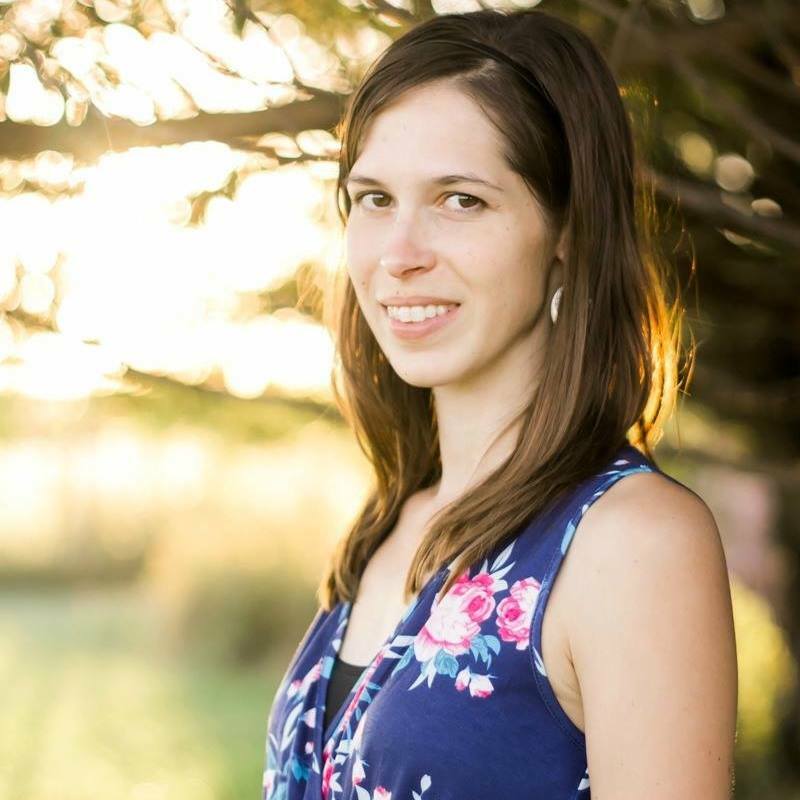 Thank for sharing with us at Merry Monday this week! I love pesto! Yummy recipe.Thanks for sharing at the #InspirationSpotlight party. pinned & shared. I just made two freezer bags full of fresh pesto! We had Israeli couscous with a chunk of frozen pesto melted and a pat of butter. Yum yum! This is delicious! Like some of the other reviewers who have commented, I use walnuts instead of pine nuts because I usually have them on hand. My sons say this is better than store bought! 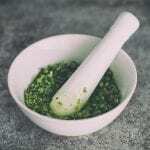 Looking for a pesto recipe to make, I stumbled upon your site! I wanted to use as Christmas gifts in small jars., but since pesto cannot be canned, is there any reason I can’t freeze the little jars until the holidays and let people know to use it quickly?